Belts, Zones, and Hoods. These are the most prominent features on Jupiter and even the smallest and cheapest telescopes can reveal them. The dark bands are called belts and run parallel across Jupiter due to its strong winds and rapid rotation. The belts are areas of sinking air that are warming up and drying out the atmosphere revealing a clearing into the darker depths. The lower, yellowish-tan clouds are composed primarily of sulfur compounds and water droplets. The bright stripes are called zones and are areas of rising air that condense into billowing whitish clouds consisting primarily of ammonia ice. The dusky cloud caps at both poles are called hoods and are usually not as prominent as the equatorial belts. Slight clearing near both poles reveals some of the deeper, darker clouds below, similar to the belts, but are somewhat obscured by ammonia haze. The North and South Equatorial Belts, which are the darkest belts, are located on either side of the equator. Larger telescopes will reveal additional belts and zones. Festoons, Garlands, and Rifts. All of these are usually thin delicate extensions of the belts that finger out into the brighter zones. A festoon bridges the entire width of a zone by connecting two belts. A garland does not connect, but instead forms a hook and may curve all the way back to form a closed loop. Another feature is known as a rift and is a bright bridge of cloud spanning from one zone to another across a dark belt. Ovals, Spots, and Knots. Ovals are noncircular patches that are usually very bright and fairly large. Spots are rounder and more sharply defined, but small. Knots are thickenings or a darkening found in parts of the belts. The most famous spot of all is the Great Red Spot. It is a huge storm of towering clouds similar to a hurricane that is colored red possibly from phosphine being churned up from far below. The Great Red Spot is over twice the size of Earth and sometimes grows redder and at other times fades to a pale salmon hue. Sometimes the Great Red Spot becomes so faint that only a dent remains in the South Equatorial Belt, within which it resides. This dent is known as the Great Red Spot Hollow. In recent years the Great Red Spot has become prominent enough to reveal some finer detail within it. A smaller red spot, known as Red Junior, recently formed and has become quite prominent. Jupiter is a world of weather where the clouds can change nightly. Sometimes a belt may split or even disappear completely such as was the case for the South Equatorial Belt during 1989-90. In this instance the Great Red Spot appeared vivid and obvious even in smaller telescopes as it did not have to compete with the darker belt in which it always resides. Many other features can be seen such as the shading along the entire edge of Jupiter’s globe. This is due to the Sun’s slanting angle into the deep atmosphere. The most defining feature of Jupiter can often be overlooked at first, which is the fact that it is not truly round. It appears slightly squashed at the poles due to its rapid rotation and the shape is known as an oblate spheroid. Most of the time Jupiter will appear 100% illuminated because it always orbits far beyond Earth, but at certain times it can appear about 98% lit which will give one edge of the globe a more pronounced dusky shading. Filters are valuable when observing any planet as they can bring out fainter detail that would otherwise be invisible. The best filter for Jupiter is green as it enhances the cloud belts and especially the Great Red Spot. It also reveals the limb shadow along the edge of the planet more readily and will make it easier to see a moon passing in front of the darker clouds. 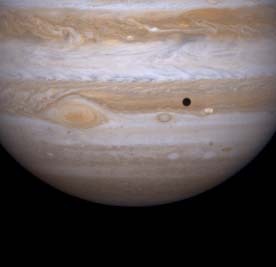 Four large moons can be easily seen orbiting Jupiter, but all the other roughly sixty moons are too small and too faint. These four large moons known as the Galilean Moons: Callisto, Ganymede, Europa, and Io, were named after the famous astronomer who discovered them, Galileo Galilei. It is a fun to watch them change positions from night to night. It is possible to determine how long it takes each to orbit once around Jupiter by plotting their positions nightly. Other interesting activities include watching the moons disappear and reappear from behind Jupiter or its shadow, watching them cross in front of Jupiter, and watching their tiny shadows cross the face of the planet. It is possible on nights of excellent seeing to be able to distinguish the varying sizes of each moon. During nights of superb seeing with a larger telescope it might even be possible to detect faint detail on Ganymede, although it will be a challenge. If a moon can be seen in front of Jupiter, it might be possible to detect some color. Callisto is the darkest moon and will appear ruddy. Ganymede may appear dusky gray. Europa is an icy world and probably will appear white. Io is a sulfur-stained volcanic world and may have a yellowish tint. These colors will be subtle, so try to observe them against Jupiter in order to cut down their contrasting glare against the blackness of space. 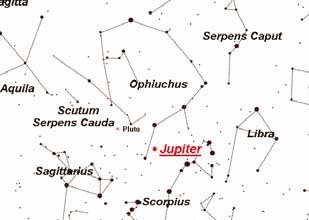 Jupiter is at opposition this year on June 5 in Ophiuchus not far from Antares in Scorpius and will be well placed for viewing, albeit at a rather low altitude. The warmth of the summer nights along with plenty of clear skies should provide many opportunities to observe it. Hazy summer conditions may actually serve as a natural filter that will steady the seeing conditions making observing finer detail on Jupiter possible. 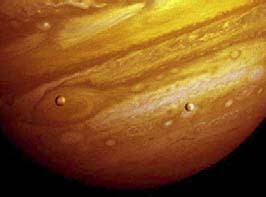 By understanding what is being seen on Jupiter and adding this most pleasant time of year, it will surely be a joy to watch the changes in its clouds and moons from night to night this summer.